THE ORVILLE 1.01 Photos "Old Wounds"
It’s 2417, and the Planetary Union promotes Ed Mercer (Seth MacFarlane) to Captain of the exploratory vessel, The U.S.S. Orville. Ed’s enthusiasm for his new position is diminished when his ex-wife, Kelly Grayson (Adrianne Palicki), is assigned to be his First Officer. 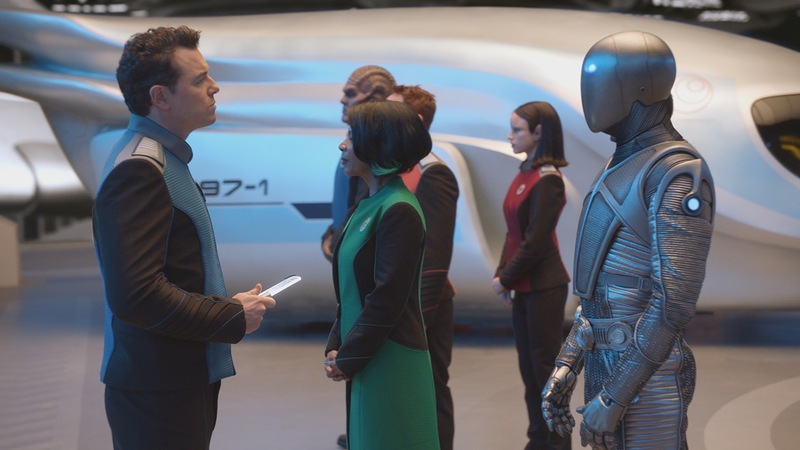 While on their first routine mission, the Orville crew is ambushed by the vicious alien race the Krill, who are bent on stealing a device that can cause time to accelerate. Jon Favreau directed the episode. Victor Garber guest-stars. Guest Cast: Victor Garber as Admiral Halsey, Norm Macdonald as Yaphit, Patrick Cox as the Ogre, Brian George as Dr. Aronov, Christine Corpuz as Janice Lee, Sean Cook as Derek, Joel Swetow as Krill Captain. Air Date: Special Series Premiere, Part 1 Sunday, Sept. 10 (8:00-9:00 PM ET/PT) immediately following NFL on FOX Doubleheader.